This article describes the steps using Web Editor. 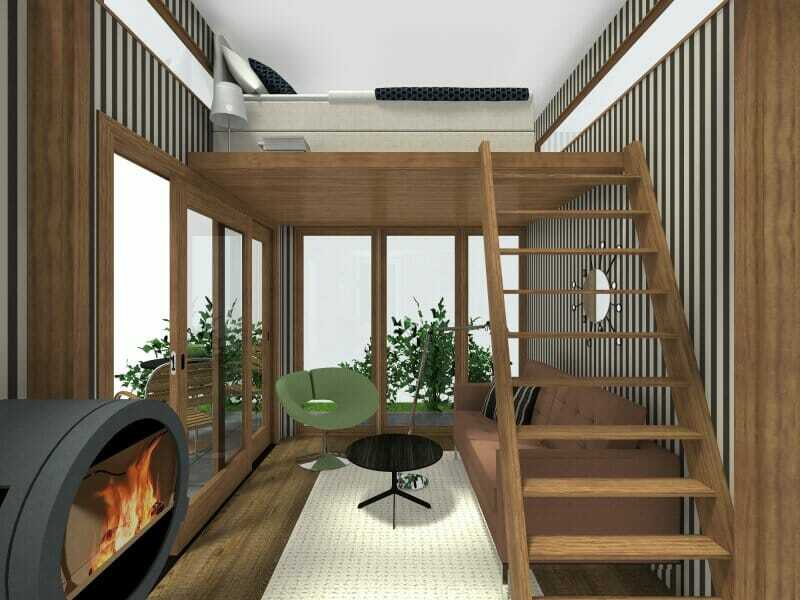 If you are using the RoomSketcher App, see Create a Floating Loft (App). Tip: To create a raised loft space that is not floating, see the article Create a Loft or Raised Area. To create the floor for your loft space you can use a "building block". Click Furniture mode and search for Building Block. Choose the block with your preferred finish, and drag and drop it into your floor plan. VIP and Pro subscribers can Replace Materials on the building block, to create different floor finishes. Right click on the Building Block and click Properties. - Height Above Floor is the vertical height where you want the floor to start. Click the check box to lock the height above floor. You've successfully created the floor of your loft! You may add support columns or pillars. In Furniture mode, search for Column and drag and drop the column you want into the floor plan. Change the Width and Depth of the column, so that it works for your loft floor. Change the Height of the column so that it matches the "height above floor" of the building block (loft) that you set above. To duplicate the column, right click the column and click Copy, then click somewhere else and click Paste. Take a snapshot to see what it will look like. If you want a railing on your loft, this can be created in several different ways. In Furniture mode, search for Column and drag and drop your chosen column into the floor plan. In the Properties window, adjust Height, Width & Depth. Adjust Height Above Floor and place the column where you want it on the loft floor. Adjust the Height, Width & Depth and Height Above Floor so that it fits the measurements of your loft floor. In Furniture mode, search for Shower Wall and drag and drop the item into the floor plan. To duplicate the glass railing, right click the shower wall and click Copy item, then right click again and and click Paste item. Drag your new glass railings where you want them on the loft floor. In Furniture mode, search for Building Block and drag and drop the building block with your preferred finish into the floor plan. VIP and Pro subscribers can Replace Materials on building blocks. Right click the building block and click Properties. Place your building block railing where you want it on the loft floor. Click Windows etc. mode and search for Stairs. Choose the type of stairs you want to use and drag and drop them into your drawing. -From the Tools menu, click Tape Measure. -Return to Furniture mode and align the Tape Measure to the place where the loft ends (the place where you want to add the stair). -Now return to Windows etc mode and you can see where to place the stairs. Right click on the stairs and click Properties. Be sure to choose Above Floor in the Type dialog box so that your stairs head up to the loft. Now you can decorate and furnish the space just like you’ve always wanted.